Will the Chiefs Have the NFL’s Most Explosive Offense in 2018? With the NFL Draft and free agency having come and gone, we’ll break down all sorts of fantasy-relevant questions entering the 2018 season. Up next is a look at how explosive the Kansas City Chiefs offense can be after adding a big-money free-agent wide receiver and transitioning to a strong-armed young quarterback. The Chiefs offense flourished in 2017, finishing sixth in the NFL with 25.9 points per game. This translated directly to fantasy, as Kansas City was the only team to field a top-12 quarterback, running back, wide receiver, and tight end. After adding wide receiver Sammy Watkins in free agency and inserting strong-armed 2017 first-round pick Patrick Mahomes at quarterback, how explosive will the Chiefs offense be in 2018 in both real-life and fantasy terms? The relevant definition of the term ‘explosive’ is “likely to erupt,“ and while there are many ways to measure explosiveness in real-football terms that will be mentioned throughout this article, we can do so as it pertains to fantasy using the Upside metric from our NFL Trends Tool. This metric adjusts for outside factors like opportunity and opponent strength by measuring the percentage of games where a player exceeds salary-based expectation by at least double. Let’s examine the Chiefs’ key players at each skill position to see they can contribute to an explosive offense in 2018. Veteran signal caller Alex Smith had a career year for the Chiefs in 2017, but a 23-year-old Mahomes will start under center for the team in 2018. It’s impossible to be certain if Mahomes will be a success, but factors like the Chiefs’ porous defense and the quarterback-friendly Andy Reid offense make a convincing case. Mahomes is a threat as both a passer (97th percentile throw velocity, per Player Profiler) and a runner (95th percentile Agility Score, per Player Profiler). We haven’t seen much of him on an NFL field, but in his one pro start, he completed 62.9% of his passes for 8.1 yards per attempt against an above-average Broncos pass defense in Week 17 of last season, which is a good sign. It speaks volumes about Mahomes’ upside that the Chiefs traded up for him in the first round of the 2017 NFL Draft and then let the more conservative Smith walk despite coming off a season featuring top-six finishes in completion percentage (67.5%), yards per attempt (8.0), and touchdown rate (5.1%). Given Mahomes’ dual-threat ability and the skill-position players surrounding him (whom I’ll cover next), he’s in a situation that could produce Deshaun Watson-like results. When incumbent starter Spencer Ware went down for the year in the 2017 preseason, rookie Kareem Hunt took the job and never looked back. Hunt’s 1,327 rushing yards led the league, and he tacked on another 455 through the air, finishing as a top-five fantasy back. The biggest reason Hunt was the only Chiefs player to be just at league average for his percentage of Upside weeks was a nine-game stretch in the middle of the season during which he scored no touchdowns. The the team seemingly learn from that lull down the stretch, upping Hunt’s usage both overall and in the red zone. And despite Hunt’s bad midseason luck in the scoring department, he was still a dominant runner, racking up more 15-plus-yard runs (18) and evaded tackles (137) than any other running back in the league last season, per PlayerProfiler. Tyreek Hill has established himself as one of the most explosive wideouts in the NFL with 16 touchdowns of 30+ yards during his first two pro seasons. This is not surprising given his 4.29-second 40-yard dash time and 6.53-second three-cone drill at the combine. Hill’s speed and quickness directly translate to the stat sheet beyond just touchdowns: Of players with 50 or more targets in 2017, Hill ranked ninth in converting the yards thrown to him to actual yards, per AirYards.com’s RACR metric. And no one ahead of Hill was targeted farther down the field on average than Hill’s 11.7-yard average. 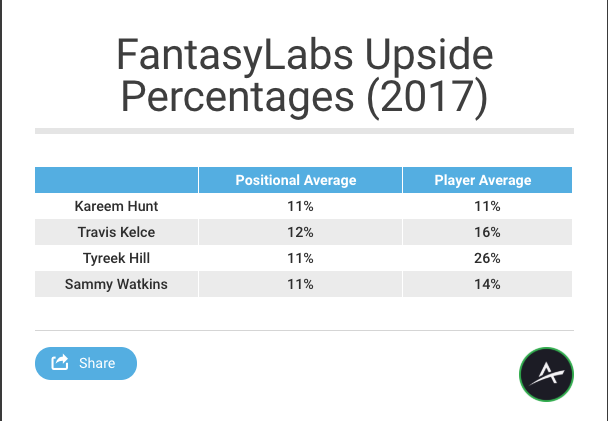 No active receiver with a sample of at least 20 games has a higher Upside percentage than Hill. The there’s Watkins, who got $30 million guaranteed from the Chiefs at the start of 2018 free agency. Watkins began his career in 2014 with the Bills, producing a 65-982-6 line in and following it up with a breakout 65-1,047-9 line in 2015 for a team that was near the bottom in the league in passing volume. After an injury-ravaged 2016 campaign in which he only appeared in eight games, Watkins was traded to the Los Angeles Rams. While the Rams utilized Watkins in a low-volume role as a deep threat (decoy? ), he made a large impact when given the chance. He was the team’s fourth-most targeted player but caught a team-high eight touchdowns and averaged an explosive 15.2 yards per reception. And though he’s thought of as primarily a downfield player, he excels at all route depths and is especially talented at turning short passes into big yardage. Travis Kelce ascended to being potentially the best tight end in the league last year. He led all tight ends in fantasy points and and was also sixth among tight ends in yards per target (8.5, min. 35 targets) despite being more heavily targeted than every other tight end. And in terms of explosive plays, no one did it more than Kelce, who racked up 19 catches of 20+ yards in 2017. The Chiefs have a running back who led the league in explosive runs and missed tackles and pass-catchers that routinely produce above expectation all over the field. Defenses will have to pick their poison when choosing how to prioritize slowing down Hunt, Hill, Kelce, and Watkins. That said, Mahomes is the linchpin for this offense reaching its true potential. If he’s as good as advertised, this offense could be the most explosive one in the league and will be churning out top-tier fantasy producers at every position on a weekly basis. 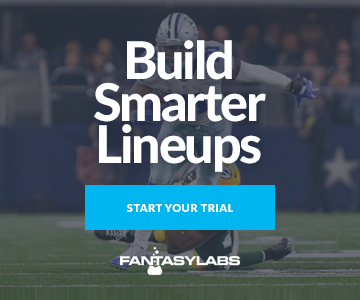 You can use our tools to research more player- or team-specific questions for yourself, and be sure to check out The Action Network for more in-depth NFL analysis.